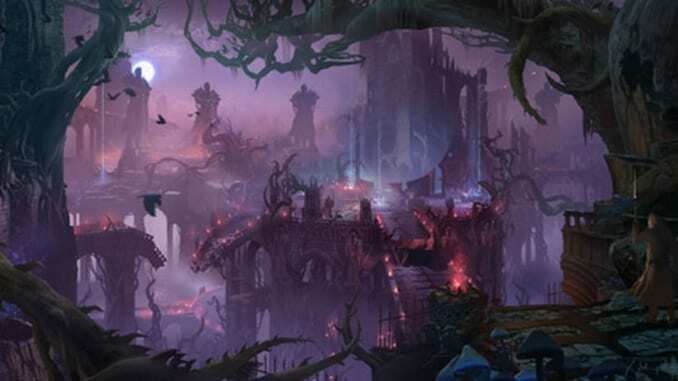 Twisted Treeline is 3 versus 3 game mode in League of Legends set in the undead-swarmed Shadow Isles. The objectives in this map is the same as the other modes, destroy the enemy nexus. Twisted Treeline is originally located near Zaun, but recent updates changed the location to the Shadow Isles. The map is fairly smaller than Summoner’s Rift. The map is elongated and the features of the island perfectly depicts the horrendous, blood-curling appearance of the Shadow Isles. Unlike the Summoner’s Rift, the Twisted Treeline only features two lanes in the top and bottom side of the map. There are jungle monsters in the middle which can help you if you are having a hard time laning. There is also an area on the top side of the map where the strongest monster, Vilemaw, is located. Vilemaw is a spider God that resides in the Shadow Isles. He is briefly mentioned in the lore of Elise, being one of the strongest creature that inhabits the island. Defeating Vilemaw grants you the ability to move through units and buff your team mates. There are also two altars in the middle of the map that grants additional movement speed if you captured one altar and restore 1% maximum health when you kill a minion or a monster if you captured two. Lastly, there is a ghost relic in the middle of the map that restores health when you walk over it. Expect a lot of fast skirmishes and intensity when playing in the Twisted Treeline. There are only 6 players in the map, so every move you make may cost you the entire game. Objectives are also very important in this game mode. Altars and defeating Vilemaw gives your team a lot of long term advantages. Always prioritze these things rather than getting a kill or farming up gold. This is a very short game mode compared to Summoner’s Rift, and everything you do has a drastic effect on the outcome of the game.